GOGO Charters is the premier choice for corporate bus transportation in the New York City metro area.We charter 18-passenger mini buses all the way up to 56-passenger full-size charter buses. Whether you’re shuttling around a small group or transporting multiple teams, GOGO Charters will find the perfect bus for you. Book your company's transportation now by calling (212) 356-0174. With various amenities including WiFi, air conditioning, reclining seats, and on-board lavatories, our sleek and professional buses are perfect for your next corporate event. Call us any time at (212) 356-0174 for a free quote! Save money on airfare by taking a charter bus right into the Big Apple! Your bus will leave exactly when you’re ready, and will take you right up to your destination. With a bus, no one will have to worry about renting cars and finding expensive city parking. However, if you prefer to fly into the city, our drivers will be ready to pick you up at LaGuardia, JFK, or Newark and transport you through the city. Our drivers are always on time, ensuring that you’ll never be late. We’ll pick up your entire group right from the airport and take you right to your hotel. Rushing through New York City’s hectic traffic can be stressful, but GOGO Charters drivers are trained to handle navigating the bustling city roads safely and efficiently. Relax with your team while your driver takes care of getting around. With a bus rental from GOGO Charters, you’ll be able to enjoy your trip stress-free through the city that never sleeps. Trying to connect your hotel group to a convention center? Schedule a personalized shuttle service through GOGO Charters instead of relying on a hotel or airport shuttle. We’ll arrive right when you need us and provide personalized corporate transportation just for your group. With a shuttle, no one will need to worry about parking, finding the event, or leaving their belongings unattended in a car. Staying at Manhattan’s Courtyard New York at Central Park while attending a convention at the Javits Convention Center? We’ll set up a shuttle just for your group so that you can attend your events and easily make it back to the hotel to relax. Or, choose from our selection of larger buses and take your entire group over at once. No one will have to get lost or find parking; everyone will arrive together. With thousands of attractions spread across Manhattan, the Bronx, Staten Island, Queens, and Brooklyn, New York City offers endless opportunities to get away from work and go exploring! A bus is the perfect way to explore the city on your own time. 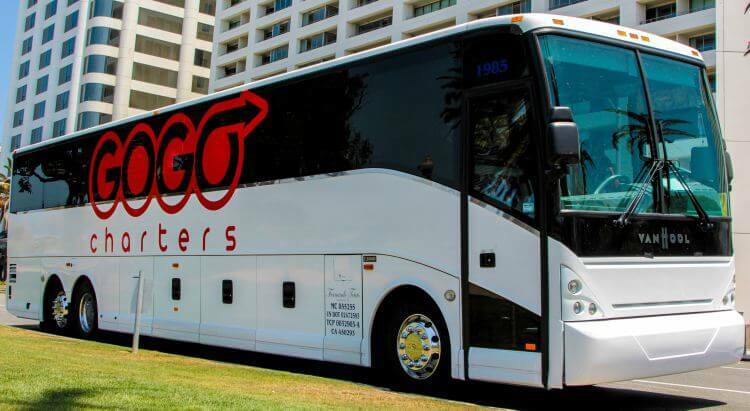 GOGO Charters can help you rent a bus of any size, from 14-passenger mini buses to 56-passenger charter buses. Whether you’re just sightseeing or making multiple stops throughout the day, we’ll help make your trip comfortable and memorable. Take everyone out to an unforgettable performance of “Sleep No More,” a unique telling of Shakespeare’s Macbeth in a live-action multi-scene film-noir style. After the show, take a minibus over to Attaboy for a few drinks. When the party’s winding down, everyone will be guaranteed safe transportation back to your hotel. Instead of renting separate cars for your event, schedule a bus for your group so that everyone can socialize on the way. Make conversation or prepare for an upcoming presentation together on one of our modern and professional buses. Make the bus your mobile office with on-board WiFi and power outlets, allowing you to get a little extra work done on your way. Buses from GOGO Charters offer a wide range of amenities, such as reclining seats, air temperature controls, TVs, DVD players, WiFi, and on-board lavatories. Questions about other amenities can be directed to our sales team 24/7 at 1-855-826-6770. With GOGO Charters, you’ll always ride comfortably through the city streets while one of our experienced, professional drivers navigates your way through the city. For corporate conferences, sporting events, weddings, private trips, and more, GOGO Charters makes renting a bus easy and affordable. One of our top-notch sales representatives will work with you through your entire rental process to tailor your rental to your needs. Leave the logistics to us while you enjoy your corporate trip in New York City. Call us today at (212) 356-0174 for a free quote today!